Snow Much Fun! Centers & Freebies! 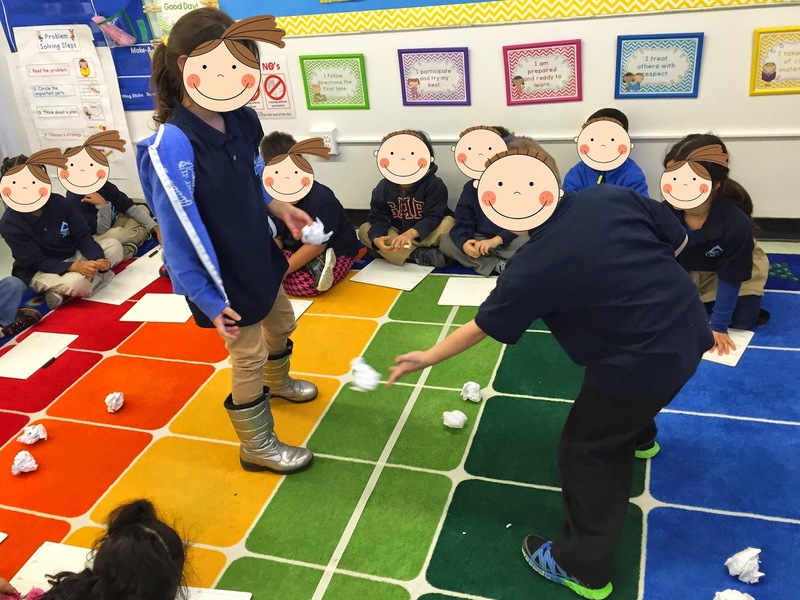 We had a snowball fight during math workshop to practice decomposing the number 10. Two students at a time had a "snowball fight" as I timed them for 30 seconds. When time was up, we lined up the snowballs and counted how many landed on each side of the tape line. Then the kids wrote the equation on their white boards. We learned lots of different ways to decompose the number 10! We also played a new game to decompose the number 10. I don't have a picture of them doing this one, but here is a copy of the activity (the recording sheet is editable so you can change the numbers). I modeled this game during our whole group lesson, then they worked with their partners at their tables. 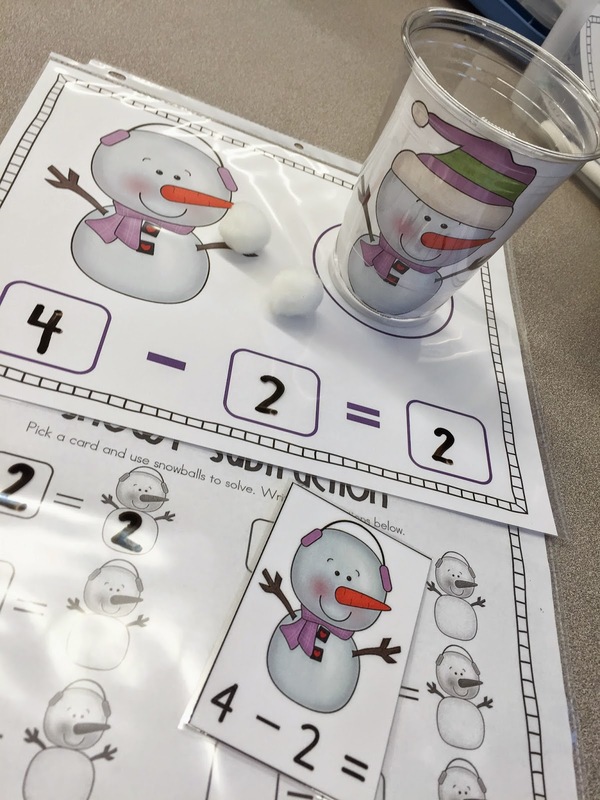 To play, they shake and spill the cup of "snowballs" onto the mat, count how many landed on each side, and write the equation. 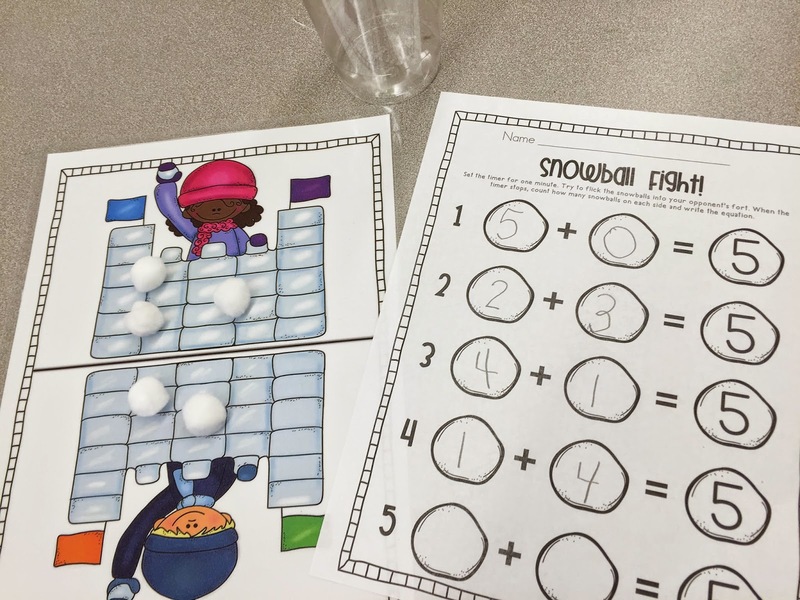 Click HERE to download your Snowball Fight FREEBIE! These centers are SNOW much fun! 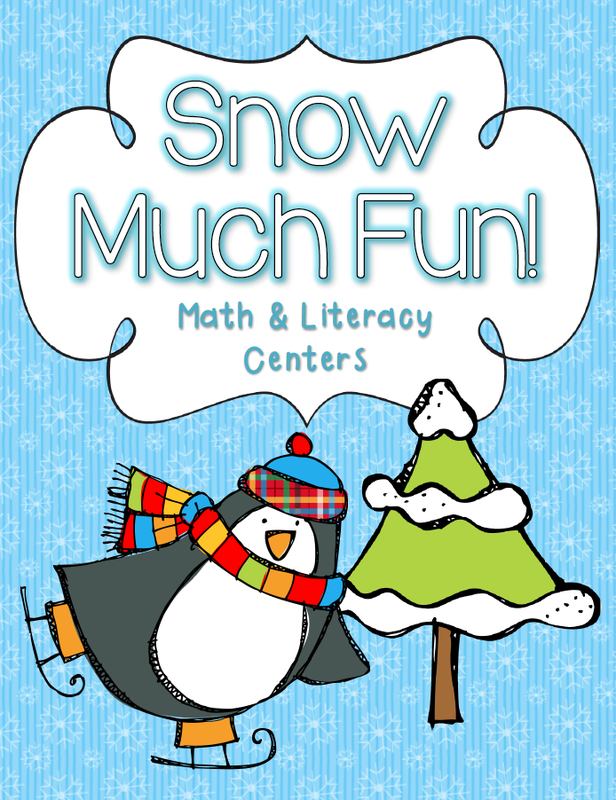 I just posted my brand new Snow Much Fun Centers pack on TpT today! This is my biggest pack yet at over 200 pages! There are 22 math centers and 17 literacy centers. Yes, you read that right! These activities will keep my kiddos busy all month long! 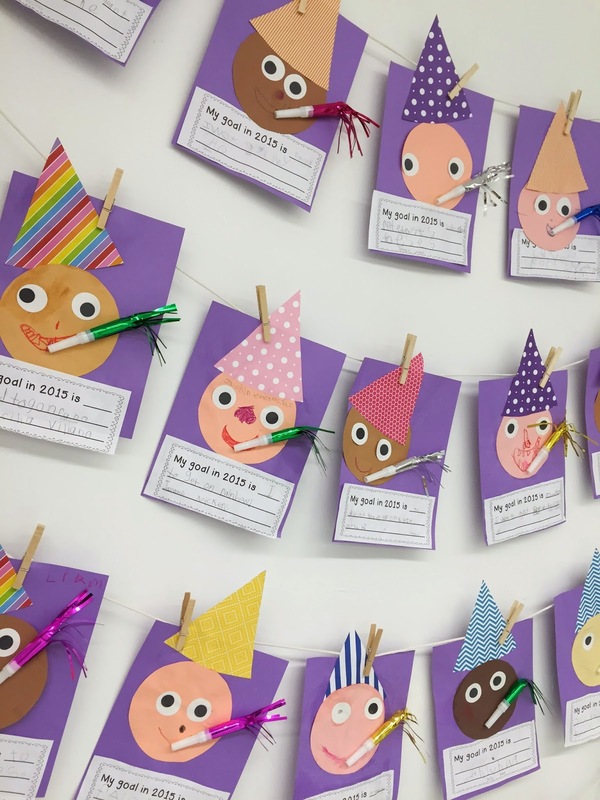 My favorite part of this pack is the new "I Can" cards I made for each activity with visual instructions that the kids can actually read and follow independently! The related Common Core standards are also listen on the I Can card for each center. We started these centers this week and the kids absolutely love them! Check some of them out below! Shoveling Snow - When I told my kids they'd be shoveling snow at this new center, they actually squealed in delight! Oh, the joy of being a child :) Anyhow, they're not actually shoveling snow, but they do shovel up some white pompoms and count them on the ten frames. Then they write the number and dot the ten frame. Add & Cover - This is an old favorite in our class. 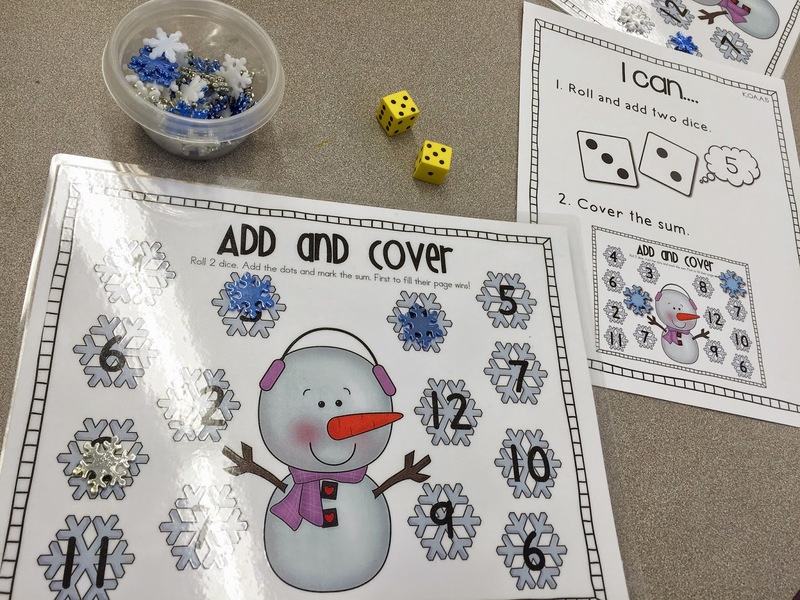 We just roll the dice, add the dots, and cover the sum with a snowflake. You could also use numeral dice instead of dots. Snowball Sequencing - We put the snowballs in order (they stick to the mat with velcro). Then we pick a card and figure out the missing number. We write the number sequence on the recording sheet. 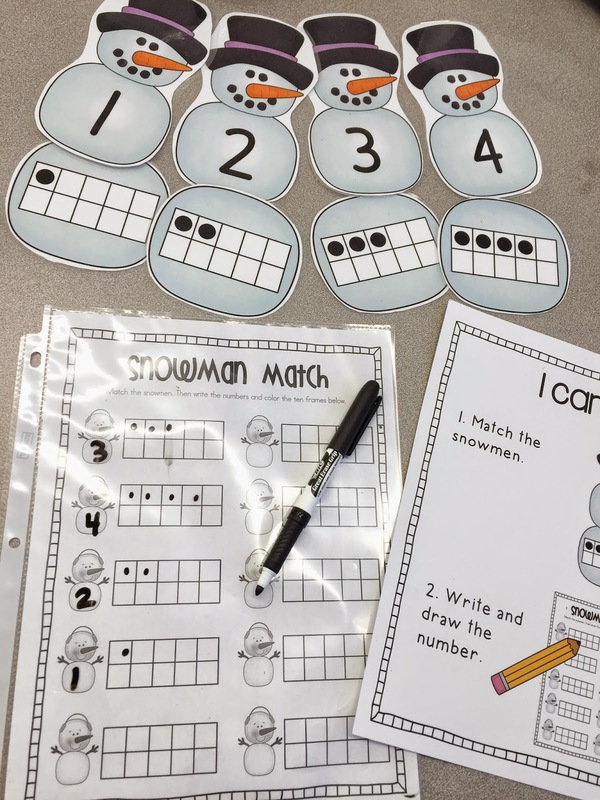 Snowman Match - We build the snowman by matching the numerals and ten frames. Then we write the number and dot the ten frame. 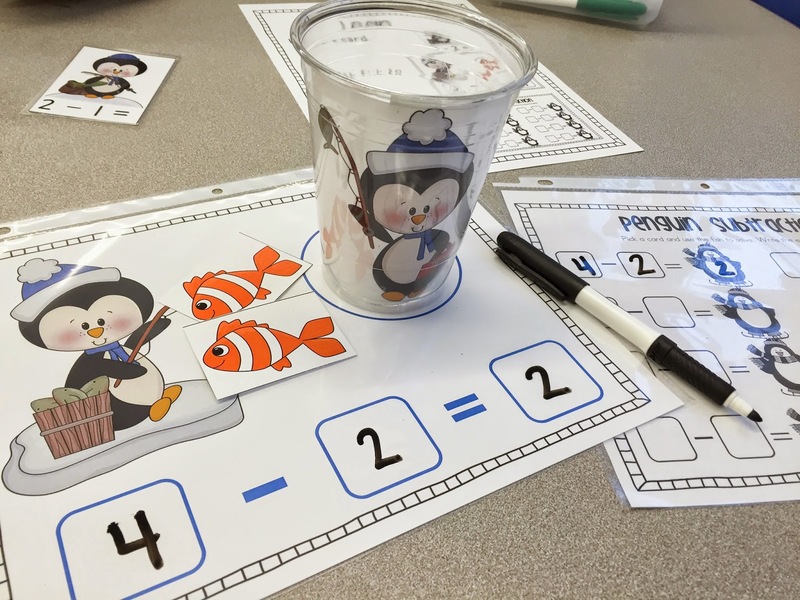 Penguin Subtraction - We pick a card and use fish to subtract. The fish that are taken away are placed into the cup. Then we write the equation. 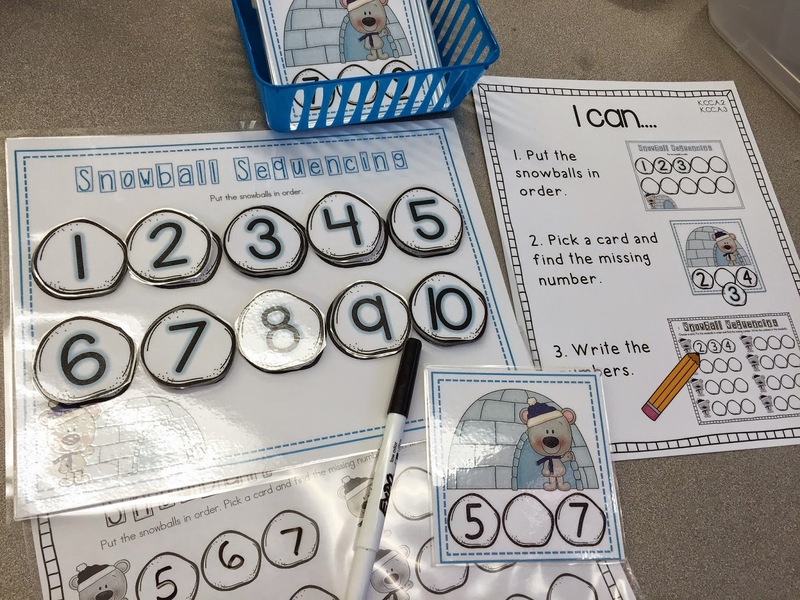 Snowy Subtraction - Same game as above. 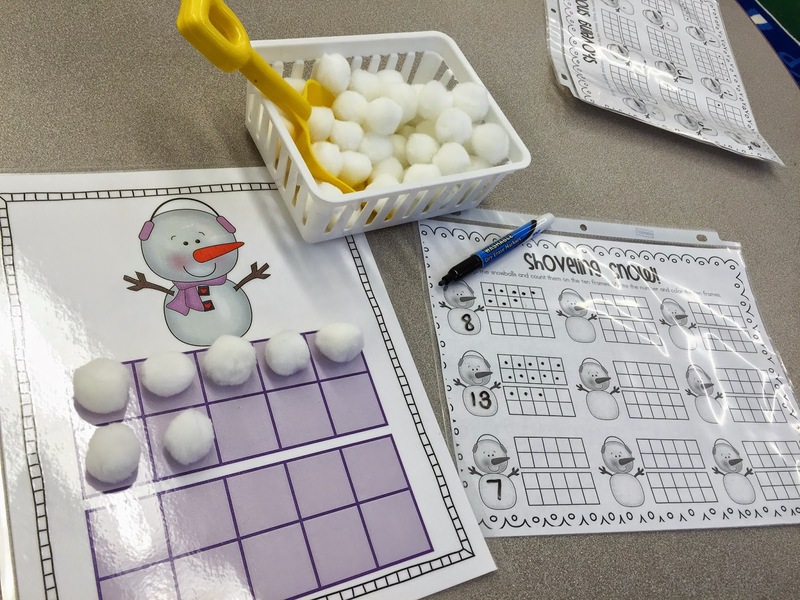 We pick a card and use snowballs to subtract. The snowballs that are taken away are placed into the cup. Then we write the equation. 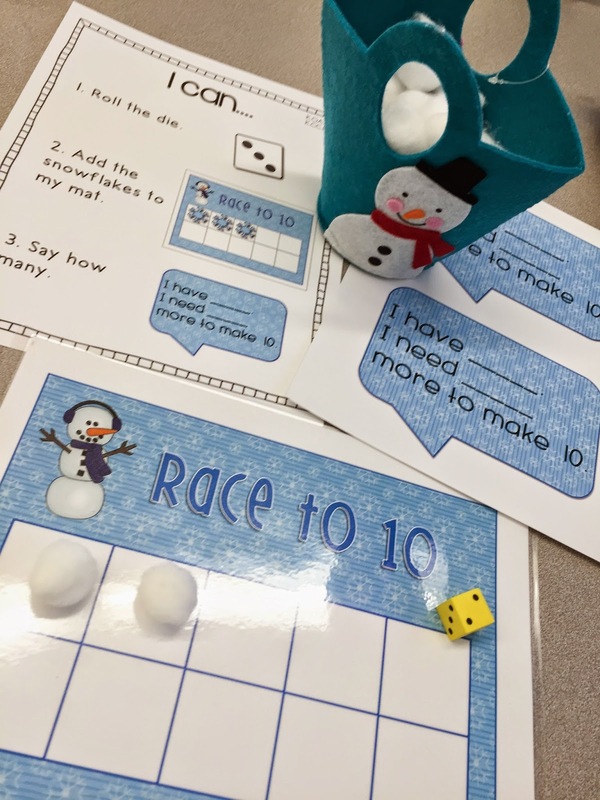 Race to 10 - We roll the die, add snowballs to our mat, and say how many more we need to get to 10. First to 10 wins! This game also includes the option to race to 20. More or less - We play this game like "War." We practice using words like greater, less, and equal using the talk card. The person whose card is greater keeps both. Mitten Skip Count - We clip the mittens in order on the clothesline. Then we cut and paste our mittens in order on a sentence strip. Snowball Fight - We shake and spill a cup of 5 snowballs onto the mat. Then we count how many landed on each side and write the equation. 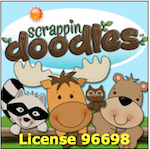 This activity can be used to decompose any number, since the recording sheet is editable. 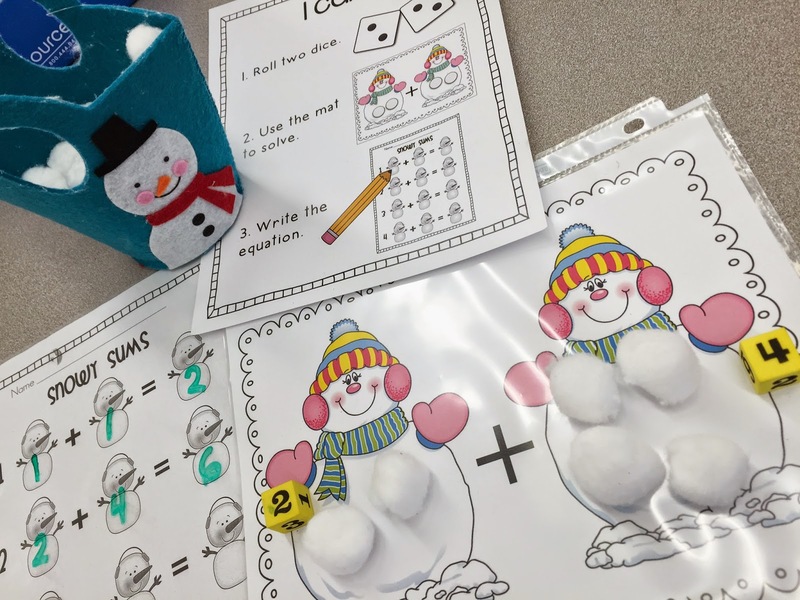 Snowy Sums - We roll two dice, use snowballs to add, and write the equation. 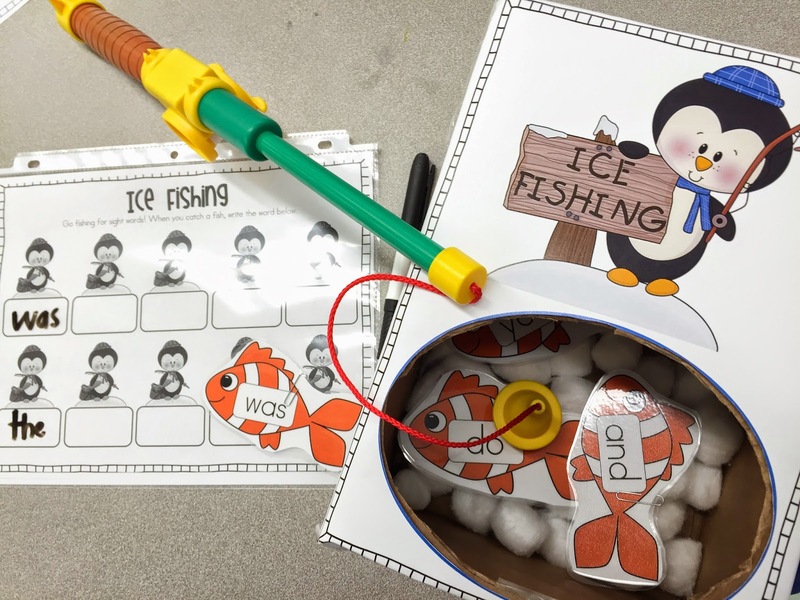 Ice Fishing - We go fishing for sight words in the ice hole and write the sight words we catch! 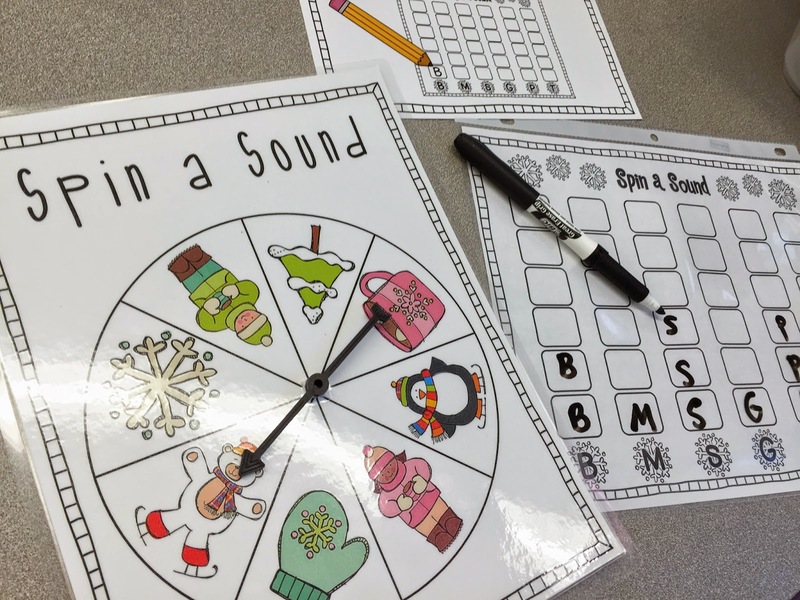 Spin a Sound - We spin the spinner, say the word, and write the beginning sound. 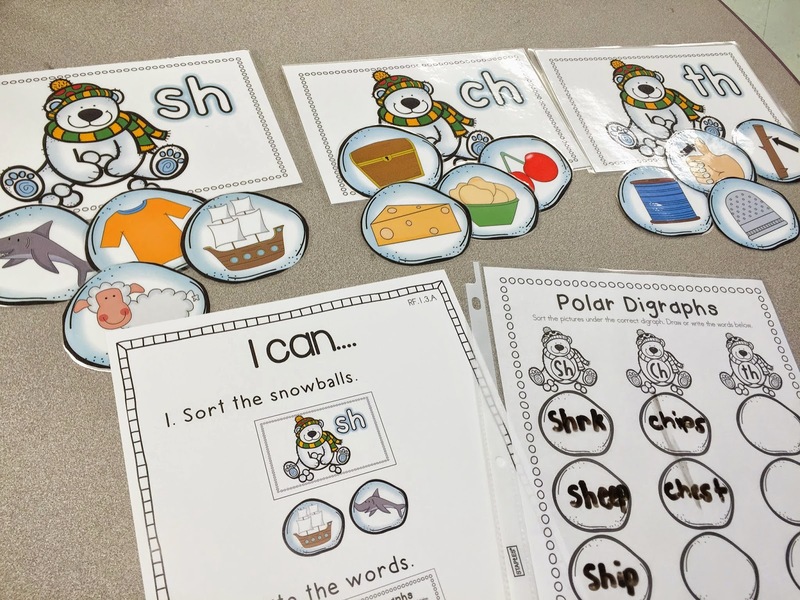 Polar Digraphs - We sort the snowballs by digraph and write the words. 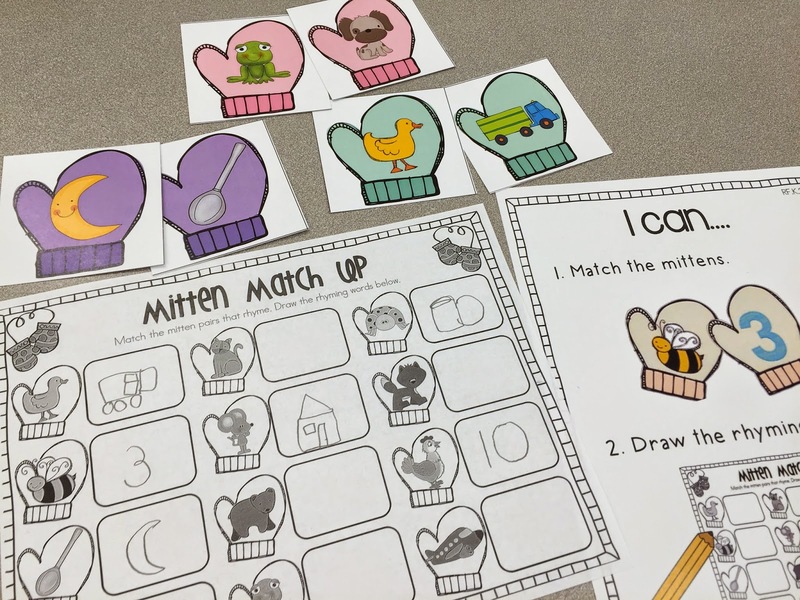 Mitten Match Up - We match the rhyming words and draw the pictures. 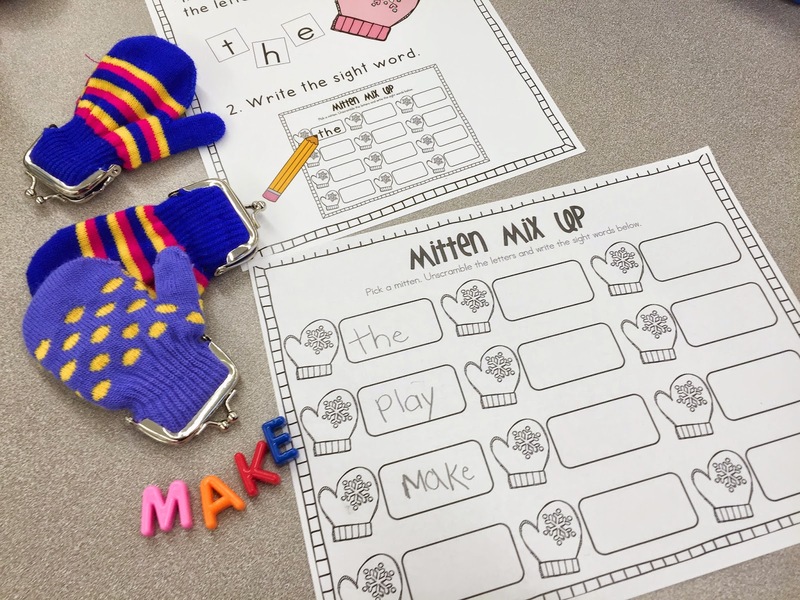 Mitten Mix Up - We pick a mitten, unscramble the letters, and write the sight word. I found these adorable mitten purses at Dollar Tree! 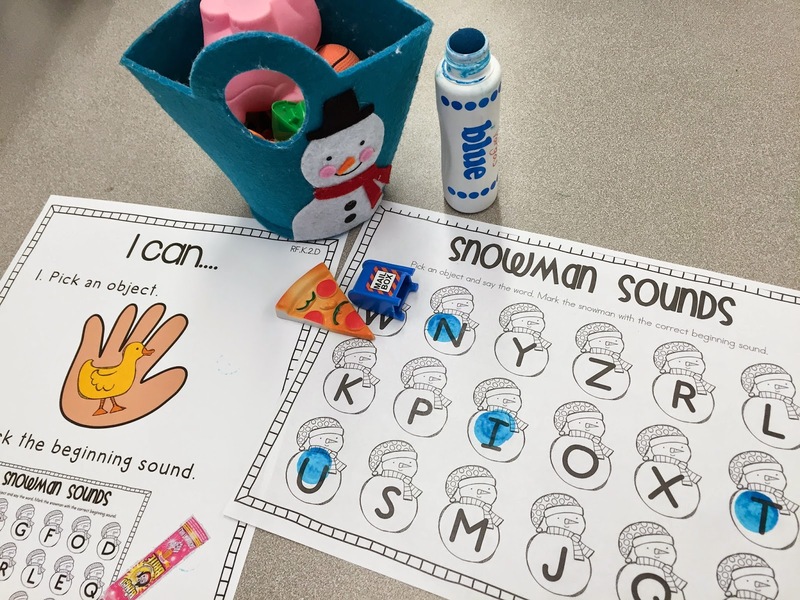 Snowman Sounds - We pick an object and dot the beginning sound. You could also have the kids stamp middle or ending sounds. 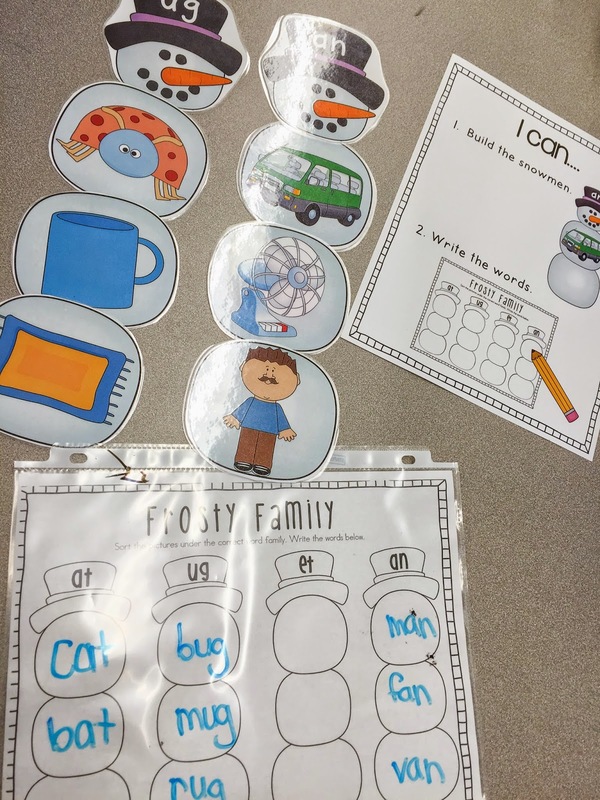 Frosty Family - We match the word families and write the words. 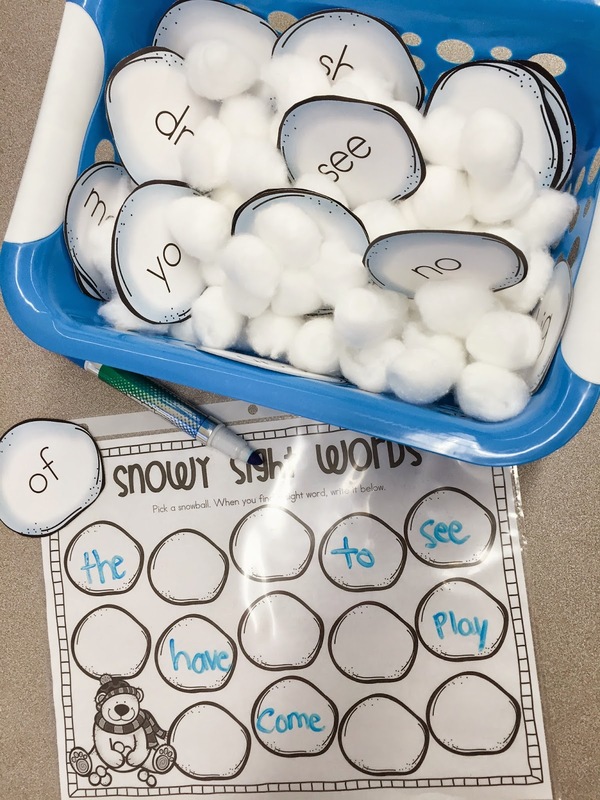 Snowy Sight Words - We pick a snowball and write the sight word. 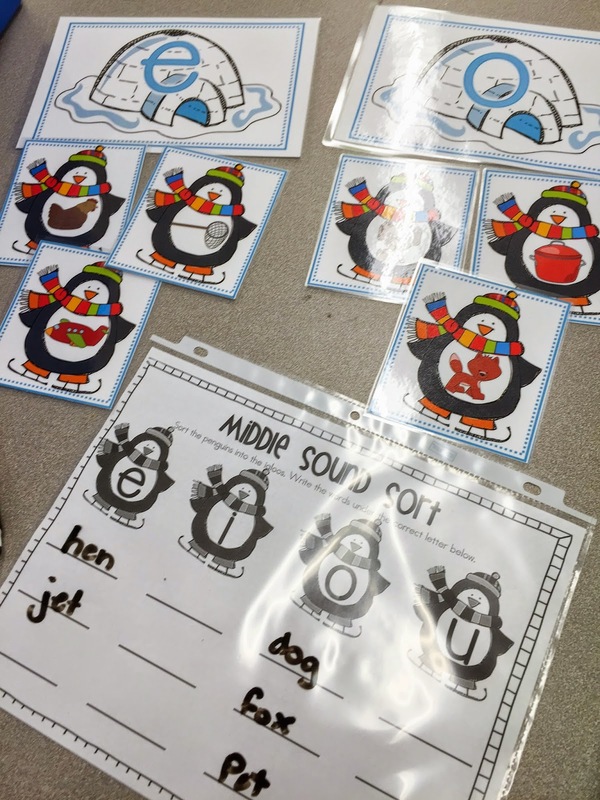 Middle Sound Sort - We sort the pictures by middle vowel sounds, then we write the words under the correct penguin. 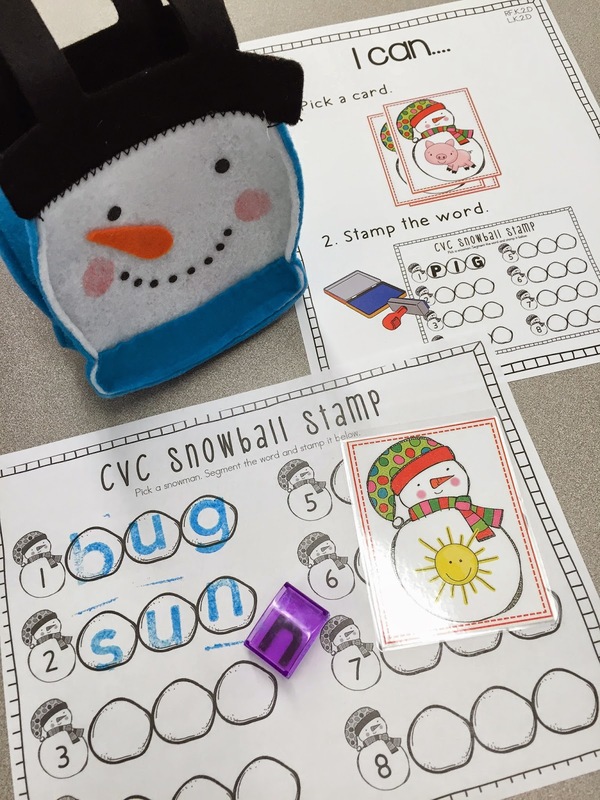 CVC Snowball Stamp - We pick a card, say the word, and stamp the word on the sheet. 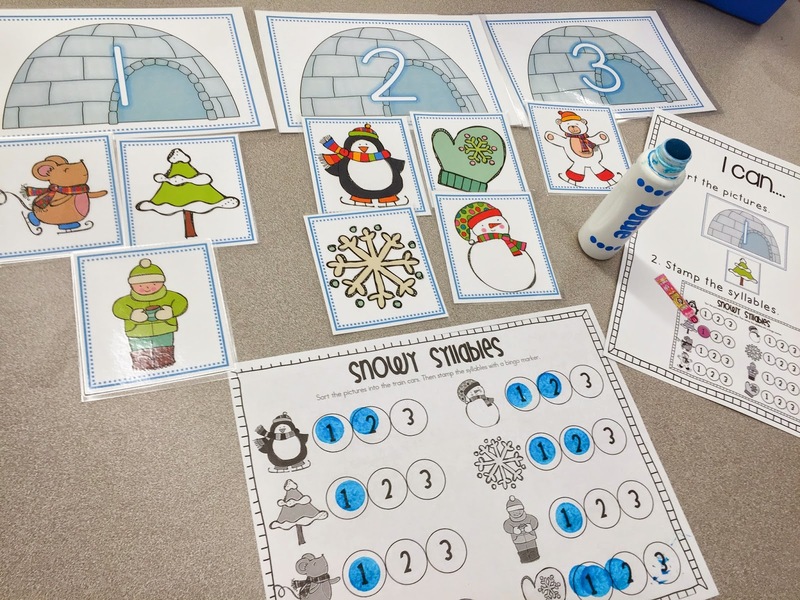 Snowy Syllables - We clap the syllables, sort the pictures, and stamp the number of syllables. 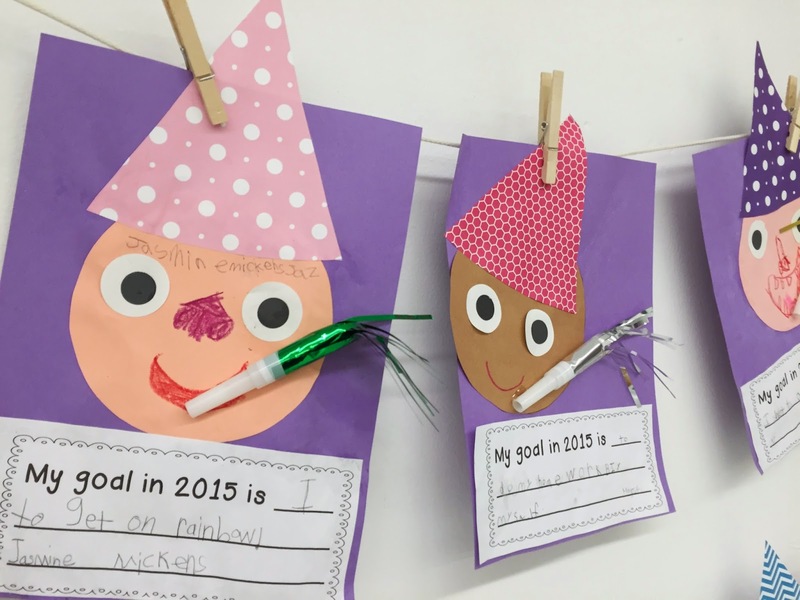 This week, I also had my kids make New Years resolutions. I found this cute idea on Pinterest and just had to try it! They turned out adorable! Click HERE for my free template. I feel the need to apologize to you all, since I know that I've been a terrible blogger lately. I am SORRY! It really is so hard to find the time in my busy schedule! My New Years resolution is to blog at least once a month this year. I know...not an ambitious goal, but I have to start small! I'm already very behind on posts, but to get back on track, I'm going to catch you up on what we've been doing this year! To begin, here is a mash up of all the fun centers and crafts we've done over the past couple months. I know this is VERY late, but I hope you find some ideas you can use next year! Holiday decorating is so much fun! 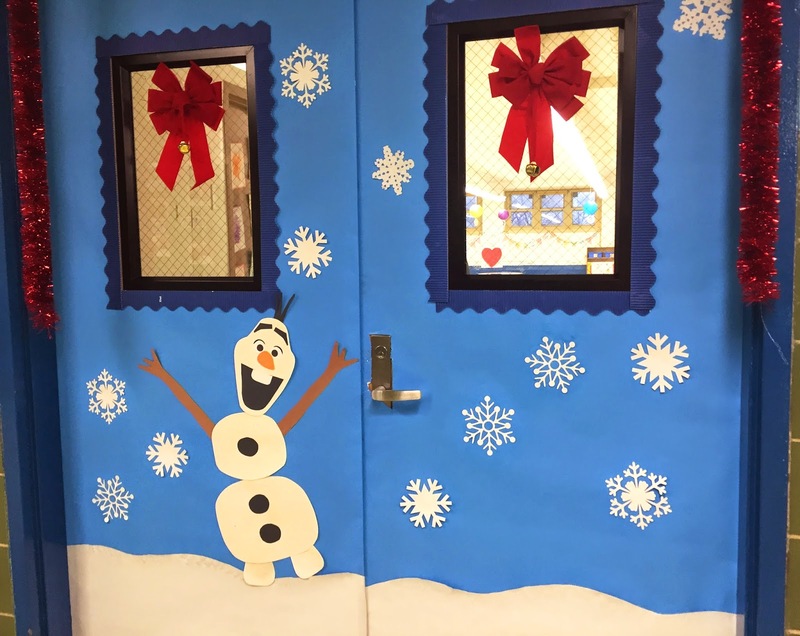 My awesome assistant Maria helped me decorate our classroom door for the holidays! I made the snowflakes and some parts of Olaf using my Silhouette cutter. I love how it came out! Winter Trees - We created these simple trees using strips of green construction paper. This activity also incorporated some math skills as the kids had to sequence the strips in order from shortest to longest to create their tree. We added a touch of white paint for a pretty snow effect! Gingerbread Holiday Cards - We read The Gingerbread Man and then decorated our own gingerbread people. They turned out cute, so we used them to decorate the covers of our holiday cards. Here is what the inside of our cards looked like. The friendly letter template can be downloaded for free HERE. During writing workshop, I taught a quick mini-lesson on the format of a letter and modeled how to write a letter through shared writing. 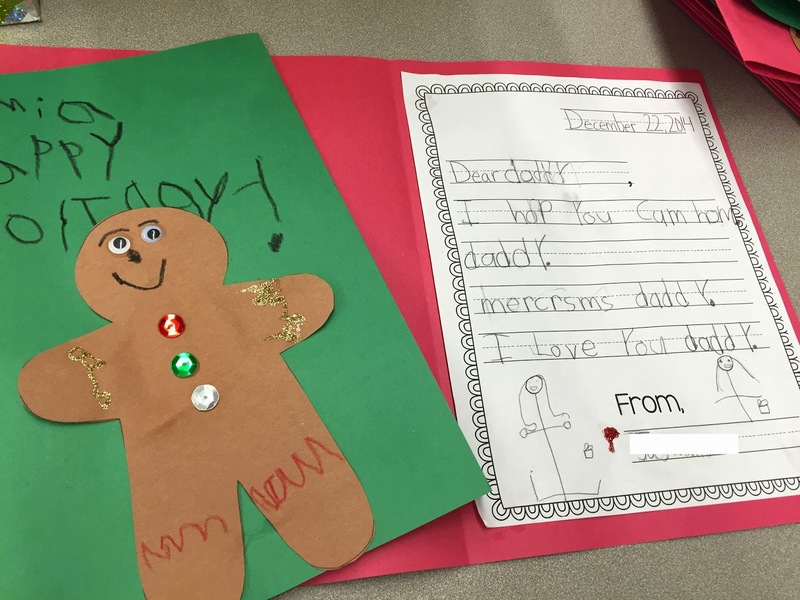 Then the kids created their own letters to their families. 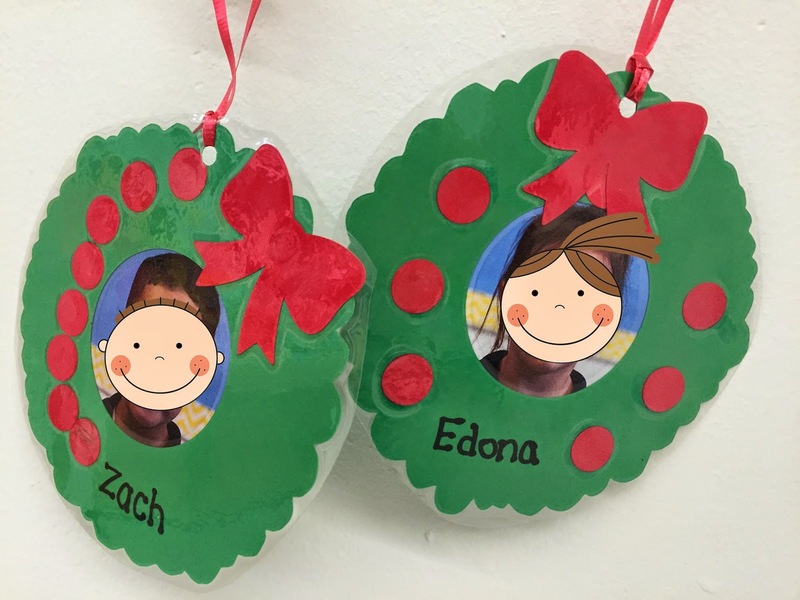 Wreath Ornaments - We created these photo ornaments for our parent gifts. I had the pieces pre-cut using my Silhouette Cameo and the kids just assembled them. Quick, simple, and cute! 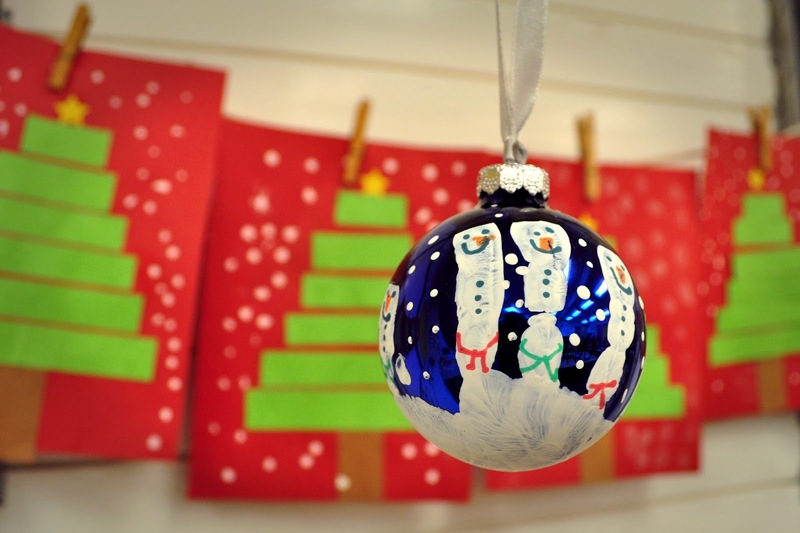 Snowman Handprint Ornaments - I usually do these every year, but we did the wreaths instead this year. These come out so pretty! Unfortunately, we don't have a sink in our room...so this would have been hard to do. Not to mention, there is never enough TIME! Syllable Express - We choose a picture and clapp the syllables. Then we sort the pictures into the correct train car and stamp the syllables on our sheet. Stocking Stuffers - We pull small objects out of a stocking, figure out the beginning sound, and color in the correct letter on our recording sheet. The small items are from Lakeshore's Alphabet Sounds Teaching Tubs. Elf Hunt - We hunt for hidden elves around the room. We read each sight word and write it on the recording sheet. I decided to put the recording sheets in sheet protectors and have them use dry erase markers to save paper. It worked much better this way! Add & Cover - I brought in some peppermint candies to spice up this old game! The kids roll two dice, add the dots, and cover the numeral with a candy. They love this one! Of course I have to tell them, "No eating the candies, or you're out of this center for the day!" 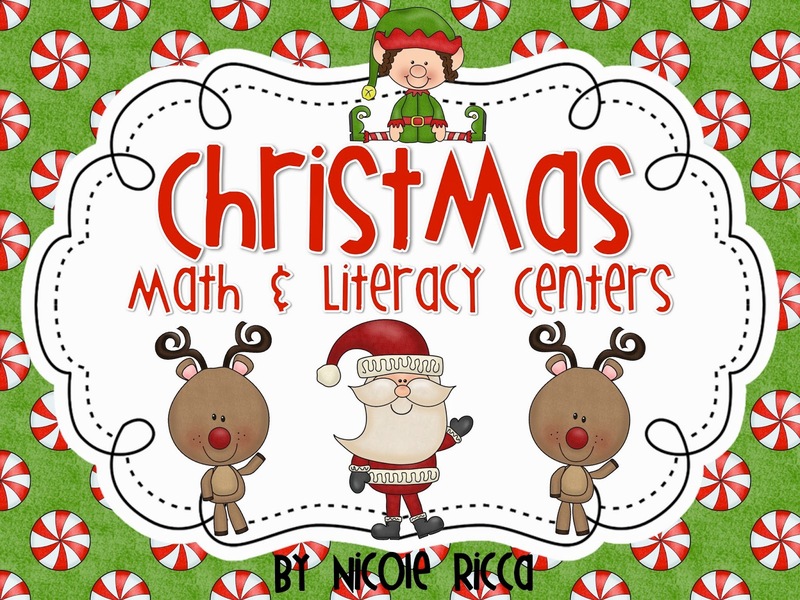 These center activities can be found in my Christmas Centers Pack! Turkey Addition - We used orange and yellow feathers to create our own turkeys! Then we wrote an addition sentence to show how many yellow and orange feathers our turkey had. Download the free template HERE. More or Less - This game is played like "War" where the person who gets the greater amount keeps both cards. 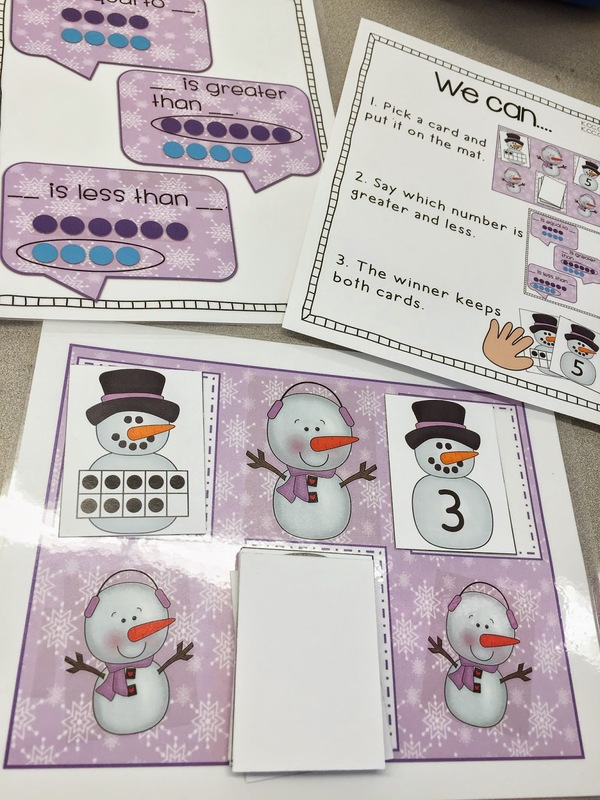 I added in some "math talk cards" to get the kids using math vocabulary, such as greater than and less than. Race to 10 - We roll the die and place the counters on our ten frame mat. After each turn, we say how many counters we have and how many more we need to get to 10. Clip & Count - We pick a card, count the objects, and clip the number. Then we record our work by writing the number in a turkey and drawing dots in the ten frame. 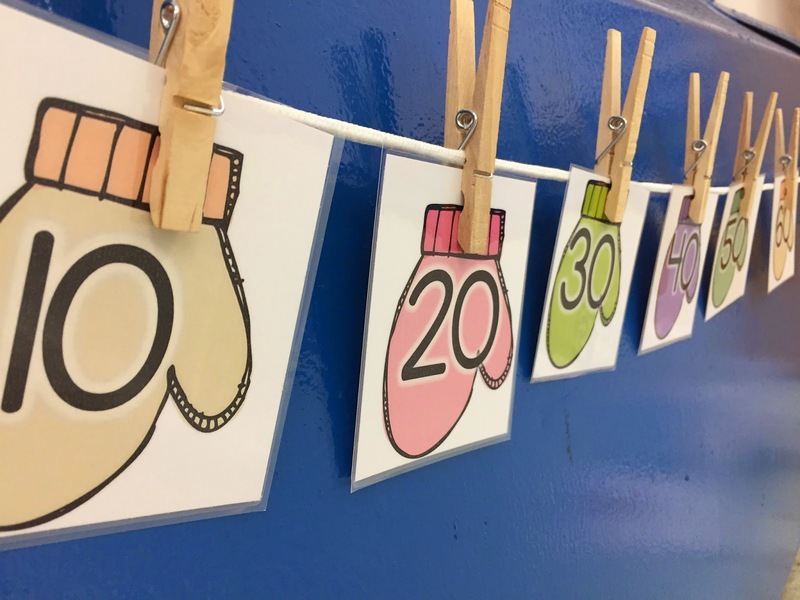 I modified this activity slightly using a different recording sheet because I wanted the kids to practice with the ten frames (the Clip & Count sheet just has them write the number inside a box). Turkey Trot - We take turns spinning the spinner, saying the word, and writing the beginning sound inside an apple. These spinners came from Amazon...and they are the best thing ever! 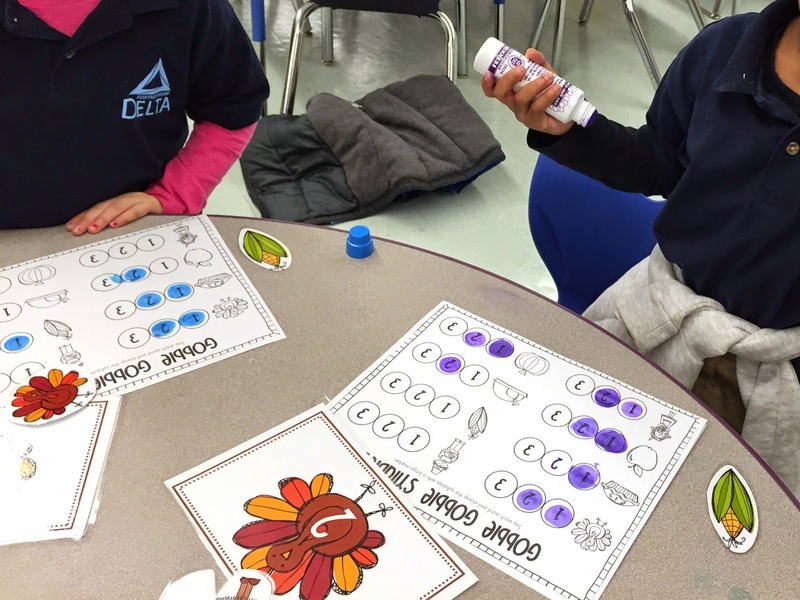 Roll a Word - This super simple game involves rolling the die, reading the sight word, and writing it on the graph. In case you're wondering, these pocket dice I use in a lot of my centers are also from Amazon! Gobble Gobble Syllables - We clap the syllables in the words, sort the pictures, and stamp our recording sheet. 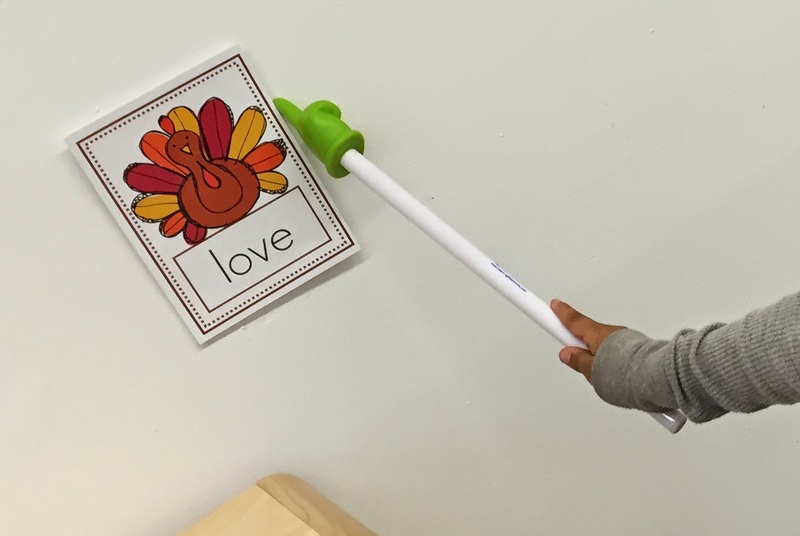 Turkey Hunt - We hunt around the room for sight words and write them on our recording sheet. Clipboards and pointers are a must for this center! 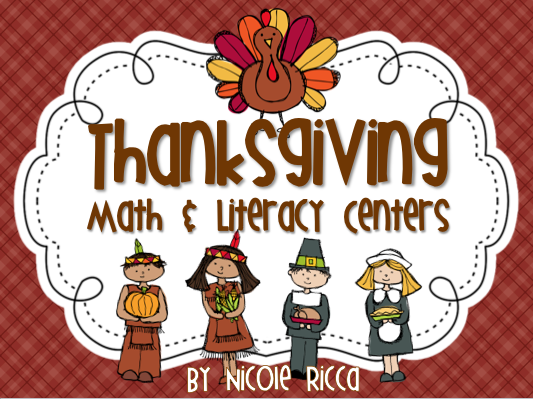 All of these center activities are included in my Thanksgiving Center Pack! That's all for now! Check back in the next week or so...I just started working on a math post with some fun ideas for addition. 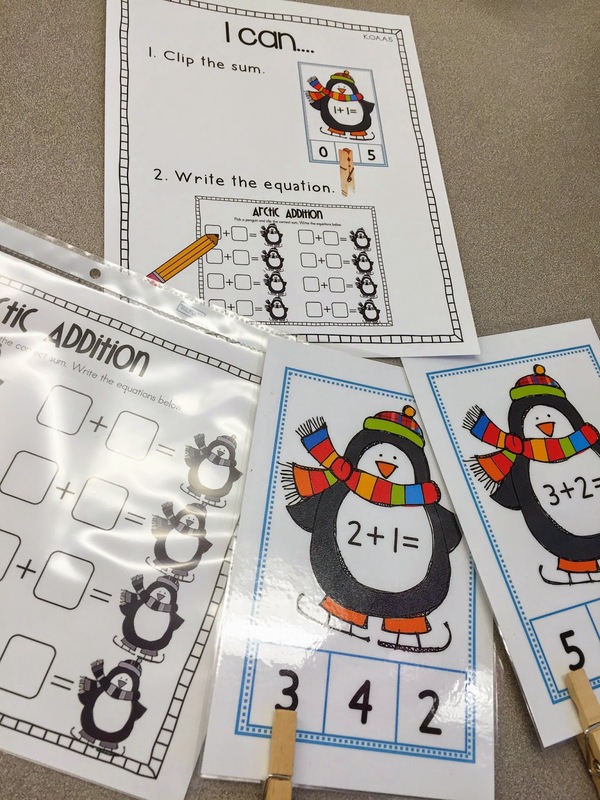 I'm also working on reading and writing workshop posts with lots of great freebies! I'll also post about my centers for January in the next couple weeks. I promise I will get back on track and keep you all up to date! Enjoy the rest of your winter break!